Our fearless leader, Clint Hurdle is telling his charges to just live in the moment. Talk about your ultimate existential man. I, too, try to live life that way, but I can't help but think of all the ways in which the stars need to align for our small-payroll, small-ball, national media darling, little engine that could Pittsburgh Pirates to make a serious run at the playoffs. So I've taken the liberty of making a wee wish list. At the top of my wish list is a giant bazooka-armed, .302 hitting (with 62 RBI) Viking in right field, which I realize is a bit like me wishing I owned an Alberto Giacometti sculpture. It'd be a nice idea, but even if I sold two kidneys, I couldn't afford one. And the Pirates should not sell two kidneys, which is to say, give up too many top prospects to get Hunter Pence. They can't give up Starling Marte, Stetson Allie, and Jameson Taillon, no matter what they're getting in return. [I'm relying on better baseball minds than mine that these three are the best prospects in the system.] You have to give up something to get something worthwhile in return, but I don't think they should decimate the farm system, even for a guy like Pence. Basically, Huntington has 'won' some of the key trades he's made -- Nate McLouth to get Charlie Morton, Nyjer Morgan to get Joel Hanrahan, Xavier Nady to get Jose Tabata. He doesn't want to end up on the wrong end of a trade and it's sounding like the Astros want too much in return. Caveat Emptor. 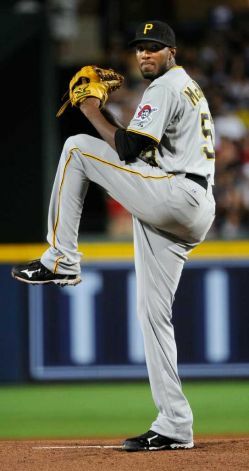 -- For Huntington to lock up Andrew McCutchen. 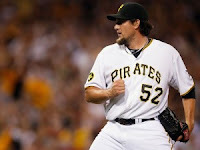 Did you know that the Pirates most indispensable man only makes $425,000 this year? Yeah, that's a ton in the real world, but in baseball terms, a mere pittance. It just seems so wrong that Lyle Overbay makes more than 10 times more than 'Cutch. So, pay the man. Pay him now. Keep him here. Forever, preferably. -- A healthy Evan Meek. I'd love to have Meek as an option in the bullpen again, but a healthy Evan Meek could be nice trade bait, too, particularly since they signed Jason Grilli. -- The ability to hit curveballs for Pedro Alvarez. This is well covered territory, but Alvarez needs to hit. He needs to get his strike out percentage down from one K for every three at bats. This team struggles to score as it is. The last thing they need is Pedro killing rallies with ugly strike outs. I'd also like to see more patience at the plate from him. Here's a for instance: Last night, he came to bat with the Pirates up 3-0 in the top of the 8th and looking to add on an insurance run or two. With two outs, Braves reliever George Sherrill had just issued back to back walks to Neil Walker and Andrew McCutchen. On a 3-1 count, facing a pitcher with shaky control, Pedro took an off-balance swing at a curveball that was way outside the strike zone. I know he was guessing, figuring that Sherrill would feed him a strike to get to a full-count, but perhaps he should think less and take more. Just a thought. -- For Brad Lincoln to contribute from time to time down the stretch. Last night, during the Buccos win over the Braves in Atlanta (can't those idiots retire the 'tomahawk chop' already? ), Greg Brown and Bob Walk were discussing the fact that James McDonald has an ERA under 3 when he's pitching on five or more days rest, and an ERA over 5 (maybe even over 6), when he's pitching on just four days rest. Which is to say, during a run like the one they are in now -- 20 games without a day off -- it would be nice to use a sixth starter a couple of times, something the Pirates cannot do if they feel that Lincoln is not up to it. -- Since we're talking about pitchers, somebody asked me who on the Pirates roster, other than Andrew McCutchen, did I think was untouchable? And I'll tell you who -- Jeff Karstens. He's maybe not untouchable, but if I were Huntington, I'd need to have a superstar on the table to even consider moving Karstens. So my wish for him is -- continued good health. In a Pirates uniform. For the remainder of this season and for many seasons to come. 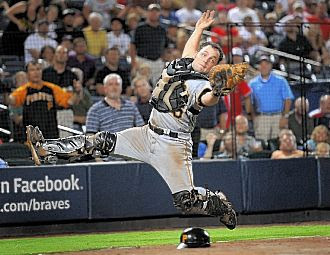 -- A good back up for Michael McKenry. I think the Pirates have found something in Fort McKenry, and I'm not alone. But as gritty as the guy is, he does need a day off from time to time. And we all know how I feel about the undistinguished Ryan Doumit, even when he's healthy. -- For Joel Hanrahan just to be Joel Hanrahan. I have some very fine Pirates memories over a lifetime of watching baseball and I have to say, every time Joel Hanrahan comes onto the field at PNC Park to protect a small lead has been positively electric, and right up there with some of my memories from the 1970's, 1980's and early 1990's. Perhaps none was better than Hammer striking out Adrian Gonzalez when the Bo'Sawks were in town. Hanrahan has swagger and charisma and attitude (along with a fastball in the high 90's) that infects the whole ballpark. I do love me some Hammer Time. Daily Pirates Ticker: 37 wins to go. How Much Pressure Is on Team USA to Win the Cup?